Title of Jesus: The one who holds the seven spirits of God and the seven stars. The seven spirits of God (the Sevenfold Spirit or Sevenfold ministry of the Holy Spirit) This is an idiom for the Holy Spirit (Isa.11:1-3) Every letter contains the expression whoever has an ear, let him hear what the Spirit says to the churches. No commendation to this church. Jesus knows what goes on in the church: “I know your deeds (works) (v.1) You have a reputation of being alive, but you are dead. (v.3) Remember (Call to mind) what you received and heard (this is a reference to the gospel message, the teaching of the apostles). Faith comes from hearing and hearing the word of God. Jesus challenged this church to remember what they received and heard and then to keep it or guard it. Do you keep or guard what you hear and receive from the word of God? We should. If you don’t wake up, I will come like a thief, and you will not know at what time I will come to you. The church is sleeping and Jesus would come against it as a thief, unexpectedly to bring judgment on it. Christ’s visit would not be pleasant! This group had not stained their garments (soiled their clothes). -The priests were to sanctify their garments before ministering before the LORD. If your garments were filthy or stained, then you could not have a relationship with God; you were not in good standing with God. Only a small group of people in Sardis were worthy because they didn’t stain their garments. How could you stain your spiritual garments? Worshiping idols, committing immorality, tolerating false teaching; compromising your convictions. It’s really easy to stain your clothing in this world if you don’t wake up as a Christian. How is your spiritual clothing today? Jesus promised this group that they will walk with Him dressed in white because they are worthy. They are pure and dressed now with the heavenly radiance. -Christ would acknowledge them before God the Father. Ancient cities had books of record if you were convicted of a crime they would erase your name from the registry. Jewish people and Hellenistic were familiar with the concept of erasing someone’s name from a country or nation. The overcomers won’t have to worry about being erased. They are conquerors as they remained faithful to God until the end. This is a source of motivation for the faithful ones in Sardis. It’s obvious that there were people in Sardis like there are people in churches today, whose names are not written in the book of life. They just go through the motion and haven’t truly made Jesus Lord of their life. -Jesus expects a watchful church that continues to work for his kingdom. 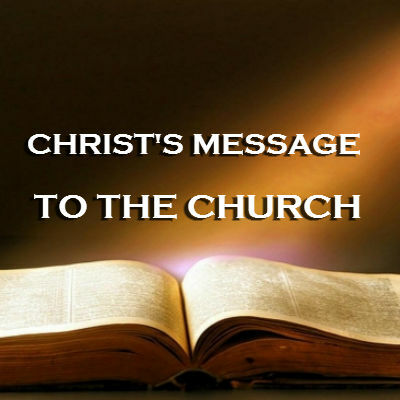 -the church should never neglect the foundation of the gospel of Christ and put in practice Christ’s teachings. Christ expects a church that will not contaminate with the ways of the world, but remain faithful to him. What is the Spirit telling you today? Wake up if you are spiritually sleeping or dying. Strengthen what remains in you before it’s too late. Part of being overcomers is to remain awake, alert in this world. It would be very hard for you to overcome anything in this world, if you are still sleeping spiritually!